My three-year-old daughter, Mila, as Boo from Disney's Monsters Inc. The costume was actually my daughter's idea originally. Like every little kid, she has a lot of different favorite television shows, movies, and characters, but when asked a few months ago about what she wanted to be for Halloween, she said that she wanted to “dress like Boo from Monsters Inc.” without a second thought. After that, it became a matter of doing some research and figuring out how exactly we wanted it to look, and what we could use to make it out of. 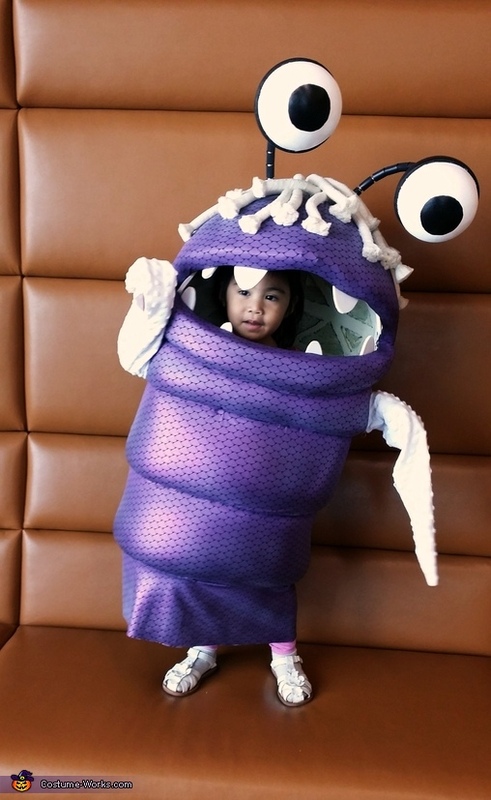 We watched Monsters Inc. a countless number of times, and I checked online to see if anyone else had made the same costume and what they looked like. A lot of time was also spent at local hardware stores, hobby shops, and fabric stores where we looked at different possible materials and fabrics to use. It ended up all coming together when I ran across some tutorials online for constructing mascot style costumes out of foam and fabric. It seemed like the perfect way to recreate this character in real life, and had the added benefit of relatively low material costs. From there, it was just a matter of executing the design and construction of the costume.